Ulster take to the field to face Southern Kings. Ulster went second in their Guinness PRO14 conference as they secured a valuable bonus-point victory over Southern Kings. 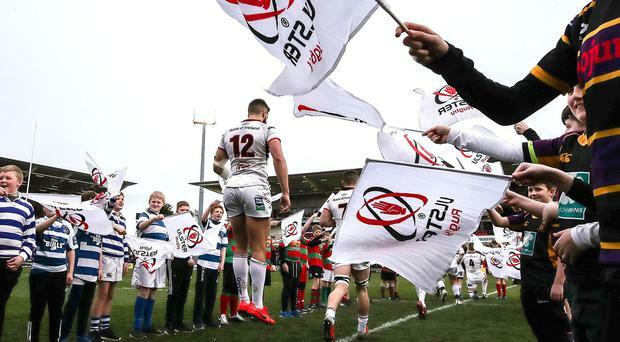 The victory didn't come without significant injury cost as Ulster are left licking their wounds ahead of Saturday's eagerly anticipated European quarter-final against Leinster. But how did the individual players perform at Kingspan Stadium? Louis Ludik 4: Didn’t last long and it will be a worry for next weekend that the South African was helped from the field after suffering a leg injury. Robert Baloucoune 7: Looked sharp and showed his pace for the bonus point try and was busy with 10 carries. He was then smashed which led to the Kings’ red card. Robert Baloucoune celebrates Rob Lyttle's try. Darren Cave 5: Shipped a knock in first half which saw him later leave the field after taking another hit in the second. Anything but ideal ahead of Aviva clash. Stuart McCloskey 7: Used power well to get Ulster off the mark and carried 12 times; made 10 tackles though would have wanted more dominance. Rob Lyttle 6: Had to be strong for his try but was then rounded by Penxe. Wasn’t the only one to slow up for Beyers’ score but also provided an assist. Billy Burns 6: Started strongly and took a heavy knock. Reminded us he can kick well from the tee with three conversions. Seemed to fade later on. Dave Shanahan 5: Wasn’t on his game as well as he would have liked. Also stopped for what turned out to be Kings’ second try and then was taken off for Cooney. Andy Warwick 7: Scrummaging was fine while his skills-set is improving and there was a deft pass to O’Toole. Lost ball in contact though a penalty was called. Rob Herring 8: Put down a marker for Saturday’s selection with 10 carries and 17 tackles and, for a while, he seemed to be Ulster’s primary ball-carrier. Marty Moore 4: Didn’t quite make the half hour and seemed to be struggling before he departed with a suspected HIA. Ulster really need him firing for Leinster. Alan O’Connor 8: Relishes work-rate and this was no exception. Strong in lineout and produced 21 tackles. Key cog in Ulster’s front five. Ian Nagle 6: Busy evening of carrying, though there was one knock-on, and tackling before making way for a notably energetic Treadwell. Matty Rea 7: Pushing his way back into starting side, he put in a pretty decent shift and at one point had to nail Penxe and did so with an all-enveloping tackle. Nick Timoney 7: Ulster’s top tackler with 23, he kept going and showed his ability to play right across the back-row. He will badly want a tilt at his home province. Marcell Coetzee 8: First game back since January and how Ulster need him. Their top carrier with 16, he also scored an important try before leaving. Ulster's Marcell Coetzee bursts forward. Angus Kernohan tussles for the ball.